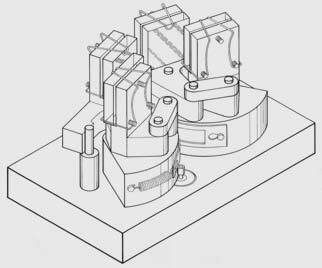 Laser attenuator, developed by Steve Hines for working safely with high-energy laser light. The attenuator is placed in the optical path near the source. The user simply turns the control knob to adjust the output brightness, reducing the risk of danger. Many conventional attenuators simply absorb energy using plastic polarizers, limiting the energy levels. Some attenuators transmit the beam through refracting prisms, degrading the coherency and quality of the beam due to the surface quality of the two refractive surfaces each of four prisms. 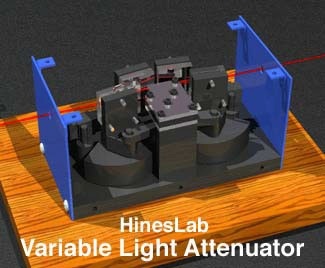 The HinesLab Variable Attenuator uses no refractive surfaces for the exit beam. The attenuator is housed in a small enclosure. The output beam remains coaxial with the input beam, therefore the attenuator can be left in place, or removed without affecting the angle of the existing beam. Top view of attenuator in positions near maximum and minimum brightness. The light trap can be seen as the block in the center. Polarized light enters the housing (from the left side) and reflects sequentially off of four surfaces. The first surface is a crystal, and depending on the angle of incidence, reflects varying amount of light through the optical path. The remaining three surfaces are first-surface mirrors and simply reflect and reposition the beam to restore it to being coaxial with the input beam. When the input beam strikes the first surface (the crystal) at near grazing incidence, a maximum of light is reflected through the system. At Brewster's angle, 0% of the light is reflected. Any light which is not reflected through the unit, is transmitted through the first crystal into a very efficient light trap. Depending on the energy absorbed into the light trap, the heat can be dissipated into the ambient, or can be cooled. Hines' original lab notebook entries for this invention.